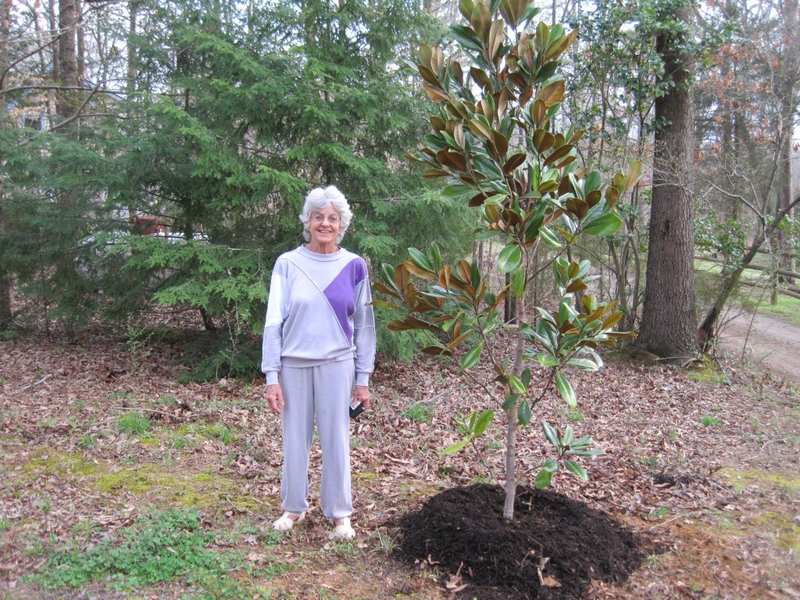 This young Magnolia grandiflora, planted today on my friend Chris’s land outside Chapel Hill, will incorporate some atoms of Jacques and will eventually grow to be 40 to 50 feet tall. Annie thats a wonderful tree and atoms of J is great!! Rick . . . soooo good to see you. D: dat tree love you! What more enduring act of faith in the future can one give than to plant a tree? Ah, you and tree look so good, standing there! You look like you are dealing/healing well w/everything, amba. You radiate peace and hope. So very good:0). 40-50 feet tall– a tree fitting to the man. Since J seemed to be half-tree himself, that’s pretty much perfect. I’m thinking and praying for Randy– always on my mind– will you let him know? Karen, your thoughts and prayers might reach him more directly than any physical message could . Word was he was (at least at the time I heard he was in hospice) no longer fully conscious and coherent.